Partners Robert Thomas and George Stevenson arrived at Holdfast Bay aboard the Buffalo in 1836, bringing with them a printing press, type, and paper, as well as trained staff to produce South Australia's first newspaper. The first issue of the South Australian gazette and colonial register had been printed in London the year before. Due to setbacks including the printer perishing in the bush on Kangaroo Island and the type accidentally being carried on the ship to Tasmania, it was six months before Adelaide's first newspaper was printed in a mud hut in Hindley Street, close to Register Place. In the meantime, the partners were kept busy with their resources stretched to the limit to print the Proclamation, which was read at Glenelg by Governor Hindmarsh in December 1836. They also printed the state's first Act (licensing the sale of liquor) and first book, the South Australian Church Hymnbook. A modern newspaper building, 1909: the home of The Register, The Observer, The Evening Journal Adelaide: W.K. Thomas, 1909. Pitt, George. 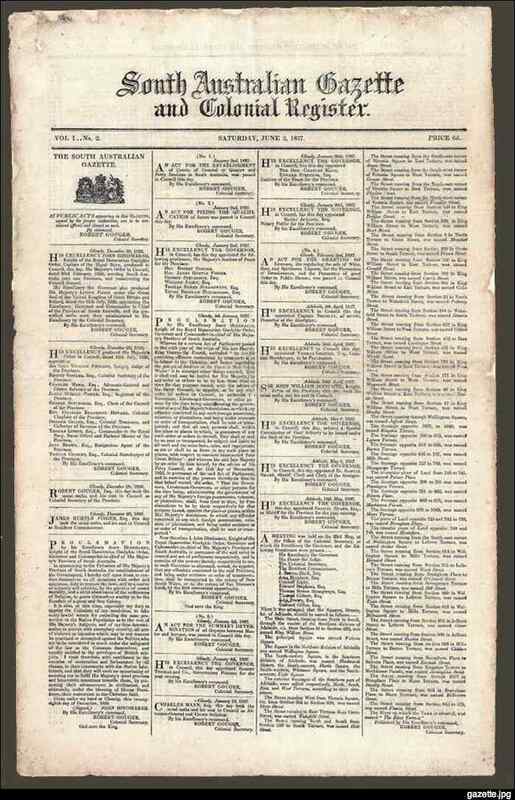 The press in South Australia, 1836 to 1850 Adelaide: The Wakefield Press, 1946. Sowden, William Our pioneer press Unpublished typescript, 1926.